The Federal Reserve Bank of Dallas has issued a report that creates a real trade weighted value of the dollar for each state. This is weighted by the specific countries where the state exports to and imports from and by how much they do so. The point is that national exchange rate indices do not always give an accurate impression of how exchange rates are affecting individual states. Oregon, for instance, trades relatively heavily with East Asia and relatively little with South America. First, how important is trade for Oregon? 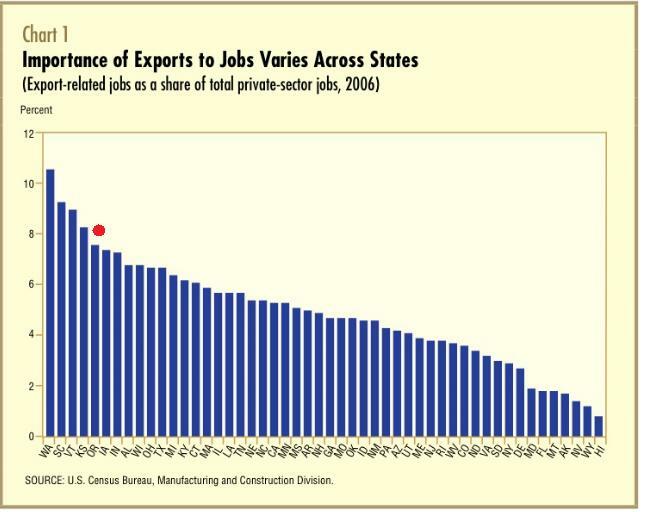 Well, the statistic I always cite is old, but the most recent we have and shows that in 2006, Oregon was the 5th highest state in terms of the importance of exports to jobs. 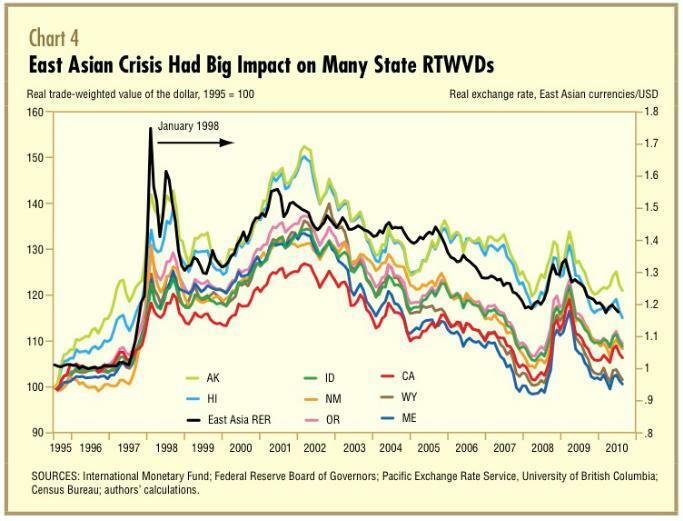 As for the importance of trade with East Asia, here is a look at how the East Asian crisis of the late 90s really impacted trade with Western states. Which is why, of course, when people ask me about Oregon’s economic prospects I always point to what is going on in East Asia, which right now is great for us. But, of course, the prospects of a major real estate bubble, social tension and a manipulated Yuan are all worrisome.